Swissôtel The Bosphorus, Istanbul is a five-star luxury hotel right in the center of Istanbul on the European banks of the Bosphorus. Nestled within 65 acres of historical gardens with world-class shopping and vibrant nightlife nearby. It offers 566 guest rooms and suites, featuring state-of-the-art technology and exclusive amenities. Wake up to views of minarets, the Golden Horn, a verdant garden and the Asian landmass across the water. Revel in five star comfort. 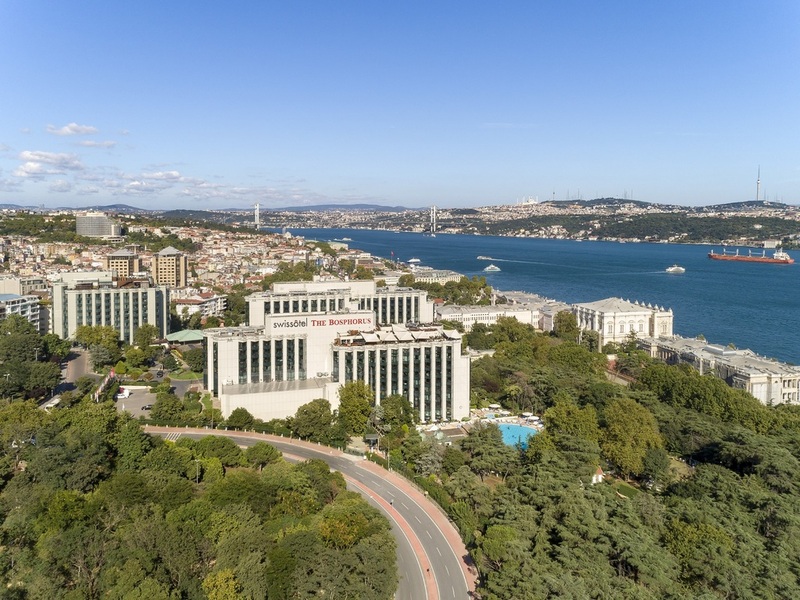 Swissotel The Bosphorus offers an array of accommodation options for modern travelers. 566 guest rooms, suites and lofts offer guests a wide range of luxurious accommodation from the comfort of a standard room to the grace of a Presidential Suite. Each room and suite is being tastefully decorated with state-of-the art amenities for rooms that are elegantly tailored to the modern guest. Delicious meals against the radiant Bosphorus, wonderful music, live DJ performances and a much more stunning atmosphere! Delight in the rare examples of culinary arts at Gaja Roof, and then feel the beauty of the night to the fullest at 16 Roof. Arranged around the luxurious pool, Oasis Restaurant is a stylish outdoor lounge and bar, serving local and seasonal comfort food accompanied by refreshing cocktails and mocktails. Experience Swissness at the Chalet restaurant in Swissôtel the Bosphorus, Istanbul. A special Swiss Festival offers a culinary tour of all things alpine, from rösti potatoes and cheese fondues to delectable chocolate desserts. MORE THAN WORLD CUISINE, IT'S THE WORLD OF CUISINE... GABBRO, bringing a new breath to the eating & drinking experience in the heart of the Bosphorus, serves the most special flavours from the world cuisines. An impressive decor combining Swiss refinement with the warmth of Turkish culture, SABROSA features breathtaking Bosphorus views and a menu full of surprises and stunning variety from an innovative and world class kitchen. The spectacular view, its attentive service and unequaled tastes, your everyday leisure at the Cafe Swiss is more of a beauty now; Best for traditional afternoon tea or a glass of drink after work would facilitate dismissing your fatigue. 만족. 다만 오션뷰가 기대 이하. 깨끗하고 View가 좋은 호텔입니다. 앞에 공원도 있고 수영장도 있고 깔끔하네요. 깨끗하고 View가 좋은 호텔입니다. 앞에 공원도 있고 수영장도 있고 깔끔하네요. 당사 Istanbul office 통해서 예약해서 방문하였고, 옥상의 야외 레스토랑과 조식도 맛있고 분위기 좋습니다. 회사 현지사무소를 통해 어렵게 호텔예약을 했다 들었습니다. 처음엔 그만한 가치가 있나 했는데 문을 열고 들어갔을때의 느낌. 창문을 통해 느껴지는 자연.... 아침식사를 한 테라스는 그야말로 생전 최고의 장소였다 생각합니다. 전체적으로 만족스러운 숙박이었습니다. 하지만 check out시에 숙박비와 min bar 사용료 관련하여 잘못된 bill은 조금 당황스러웠습니다.